The fall of 1981 was a special time in Wink Wildcat history. This group of Cats is one of only two Wildcat football teams to make it to the state finals. The Wildcats were led by Coach Robin Byrd and seventeen senior Wildcats. 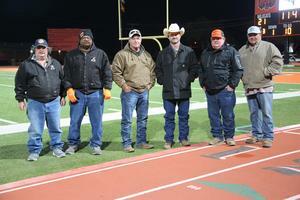 The Cats stormed through the playoffs, and fought in the state finals against the Bremond Tigers at San Angelo Stadium. The Wildcats lost a heartbreaker – 12 to 9. The Wildcat community would like to recognize and congratulate you on this tremendous accomplishment. At least two teammates on this squad have passed on. Mr. Joe Wolf and Mr. Jimmy Henderson were key members of the 1981 Wildcat team, and their memories live on. To the entire 1981 team, we thank you for your dedication to your school and our community. PICTURED: Kevin Daniels, Johnny Walker, Gayland Richardson, Paul Putnam, Ronnie Thomas, Martin Garcia. Present, but running chains: Raymond Dodd & Brad White.